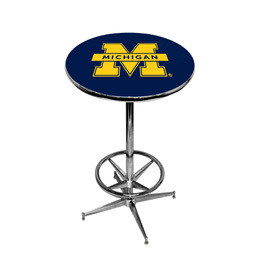 Decorate your gameroom with the ultimate college logo pub table. This commercial grade table has a 27" diameter and 16" wide school logo that is applied with a digitally printed high pressure laminate. Logo and color are fused together to form a gloss finish that will not wear off in heavy use conditions. The table stands 43" tall and has a chrome finished base with a ringed foot rest.